Take part in the annual Palm Sunday Parade! 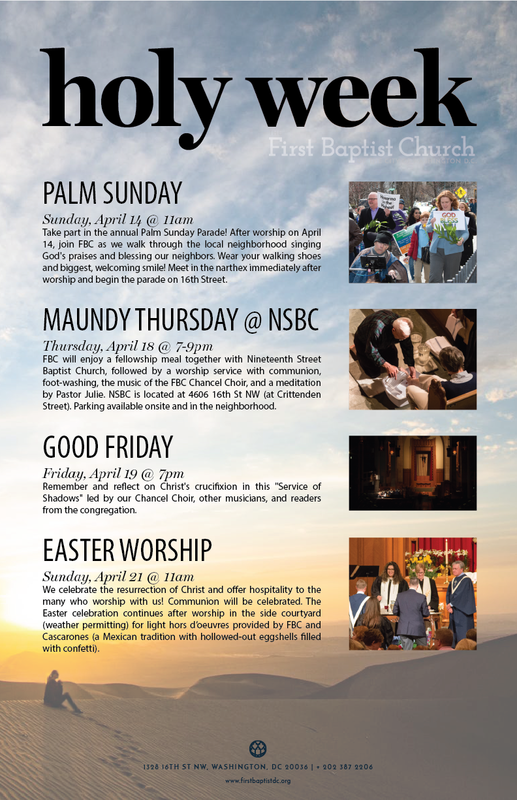 After worship on April 14, join FBC as we walk through the local neighborhood singing God's praises and blessing our neighbors. Wear your walking shoes and biggest, welcoming smile! Meet in the narthex immediately after worship and begin the parade on 16th Street. FBC will enjoy a fellowship meal together with Nineteenth Street Baptist Church, followed by a worship service with communion, foot-washing, the music of the FBC Chancel Choir, and a meditation by Pastor Julie. NSBC is located at 4606 16th St NW (at Crittenden Street). Parking available onsite and in the neighborhood. Remember and reflect on Christ's crucifixion in this "Service of Shadows" led by our Chancel Choir, other musicians, and readers from the congregation. We celebrate the resurrection of Christ and offer hospitality to the many who worship with us! Communion will be celebrated. The Easter celebration continues after worship in the side courtyard (weather permitting) for light hors d’oeuvres provided by FBC and Cascarones (a Mexican tradition with hollowed-out eggshells filled with confetti).